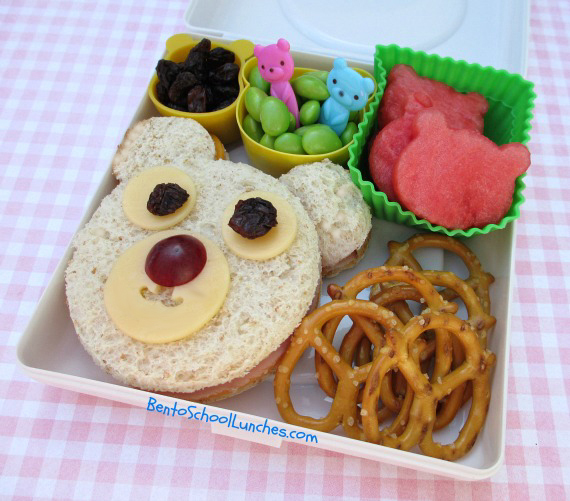 This is an easy to make bear face bento that only required a few circle cutters. Bear Face sandwich is cut from three circle cutters, face accents are from smoked gouda cheese with raisin pupils and half of a red grape for nose. A dab of honey helps hold the accents in place. Pretzels on the side. Raisins and edamame in bear shaped cups. So cute! Love the bear picks peeking out of the edamame. Love this lunch! I love how it showcases just how easy it is to make a lunch cute! Aww such a cutie bear!